Holman Plumbing & Water Treatment - SEO And Website Design Projects | SilverServers Inc. The SilverServers Grassroots seo program that we created right here in Kamloops improves the health of websites for businesses near, far, or anywhere in between. A great example of this is the website of Holman Plumbing & Water Treatment from Duncan BC. 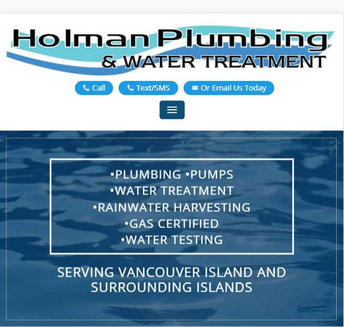 Holman Plumbing & Water Treatment is a residential and commercial filtration, treatment, well pump, plumbing, and rainwater harvesting service provider for all of Vancouver Island and the surrounding islands. They also provide electrical, gasfitting and pipefitting services related to the work they do. The initial setup of the website was just like many others. We installed our custom built Paradigm Content Management System onto their old website design, made some minor modifications, then launched the site in August 2017. Their new mobile-friendly, responsive design website is now fast – loading on desktop computers in about 1 second with a page size just less than 1MB. Within the first two months of launch they started showing up on the first page for many relevant search queries. This website is a great example of the content-based SEO work we can do for webpages. Holman's old website followed an old approach to SEO of having tons of pages with duplicated content where only a location name was different on each page. Since we didn't want to delete any of the URLs, our plan to fix this was to rewrite each page with custom, unique content. We learned a lot about Vancouver Island in that process, and created many quality pages of content that are now unique and optimized for search engines. Something unique about this website's setup is that it is the first time we implemented a "Text Us" button on a site. If you were to visit their domain on a mobile device and click that button (at the top of the screen), you would be able to start a text conversation with whoever is carrying the phone connected to that button. This will be a useful tool for Holman Plumbing. It is also a great option for any business owner who is too busy to answer the phone all the time and wishes customers could easily text them! If you need Plumbing, Pump, or water services, give Holman Plumbing & Water Treatment a call! For questions about websites though, you can check out our News page for tips and updates about SEO or Contact us directly!